It lies on the eastern sides of a small branch of the eastern Rift Valley (Omo depression), in the Debube Omo Zone of SNNPRS. It is located about 530 and 785 km southwest of Hawassa and Addis Ababa, respectively. The Park is fortunate in possessing of numerous rivers and streams, which are by far reasons for the rich wildlife resources of the area. Mago River rises from the northeast highlands of the area and cross the park (north to south) and feeds the Omo River. There are also different perennial rivers like Neri River and other streams, which both are empting to Mago River. 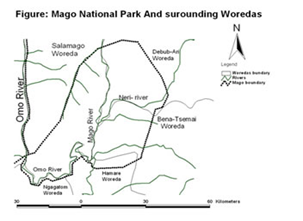 Omo, Mago, and Neri River, mount Mago & mursi escarpment are typical features for the Mago National Park. The Park is 785km and 560 km south of Addis Ababa and Hawassa, respectively. The road from Jinka town to the park covers a distance of 34km all weather gravel road. The park has about 200km internal roads, which lead to the different attraction sites of the park. Many national & foreign tourists in the Mago National Park commonly visit the following attractions. These include the Hot Springs, Forest and savanna habitats, the topography (Murssi mountains and the different view points (Vantages over looking the park whole view) along the high way of Jinka-Murssi.